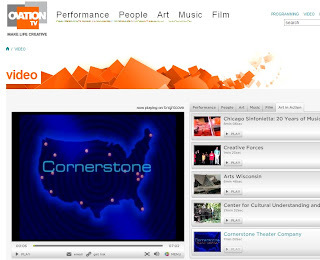 OvationTV is an interesting channel/service that's now hosting a ton of arts videos. It's fun to browse through and see what's there. Recently, they added the Cornerstone video to their Arts in Action listing...you can see their stream of it here, or just head over to OvationTV and start browsing yourself. Speaking of Cornerstone, it looks like we're off to Holtville (current temp = 102) to check out A HOLTVILLE NIGHT'S DREAM in a couple of weeks.